In many cases you might prefer rendering your scripts at the bottom of the page, e.g. before the closing </body> tag, as this generally improves site performance. Whether you are inserting your form using a macro or adding it directly in your template, you need to make sure ExcludeScripts is checked/enabled. 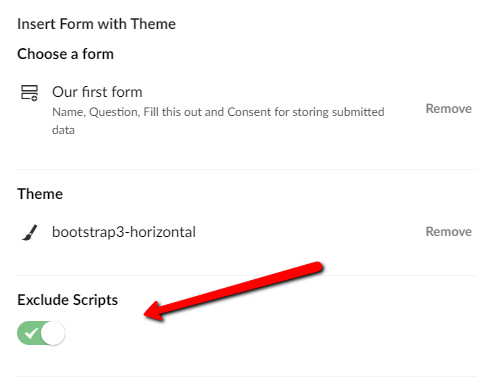 Here we'll make a small change: In the RenderAction call we'll provide an additional argument: mode = "form"
Please be aware, that is not the suggested way of inserting an Umbraco Form. We suggest you inherit from Umbraco Controllers. If you can not do that, you will need to create a new UmbracoContext. If you do so, please also read the Common Pitfalls.